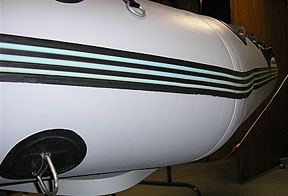 Inflatable boat repair paint for PVC and hypalon fabric inflatable boats. Inflatable boat repair paint for PVC and hypalon fabric inflatable boats. 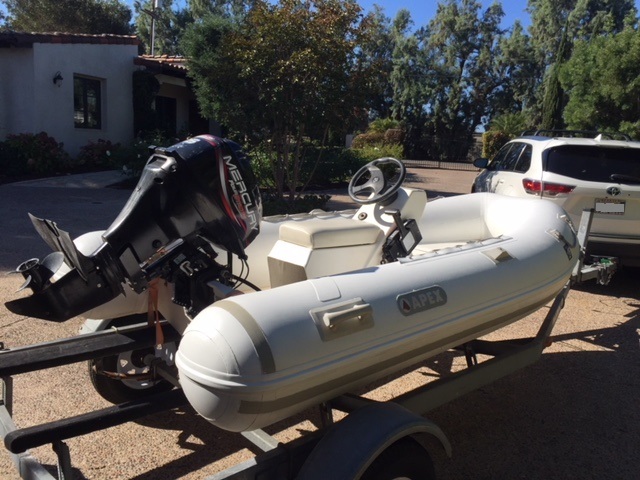 Can also be used to repair inflatable kayaks, inflatable canoes, towables and other inflatable products. Read customer feedback and view their restored boat pictures below. Not sure which paint you need, or how much? Visit this webpage for details. 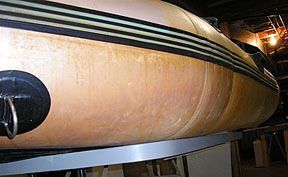 Before using our paint (sticky, brown and ugly) ...to this restored boat, and save you money! fter using our paint (restored, fresh, beautiful). Over 1,500 restored inflatable boats and kayaks and happy customers to date. We are the "original and largest SRC Tuff-coat supplier". Buy from us - a trusted name you know. Read customer feedback and view their restored boat pictures below. Renew your old, faded, sticky, deteriorating inflatable with Tuff-coat, this proven synthetic rubber coating and save thousands of dollars. Inflatable repair paint comes in 5 colors for inflatable boats, inflatable kayaks, dinghies, inflatable canoes, inflatable boat accessories and other inflatable products. Create leakproof membrane of pure rubber to restore your inflatable boat. 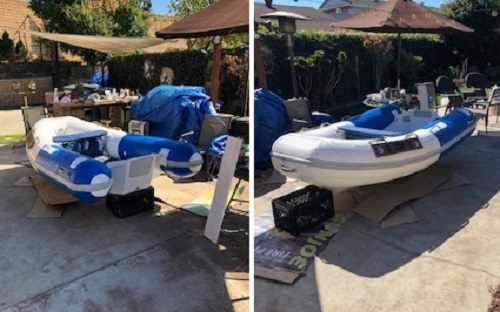 For repainting your inflatable boat or kayak. Won't peel off! Stays Flexible. 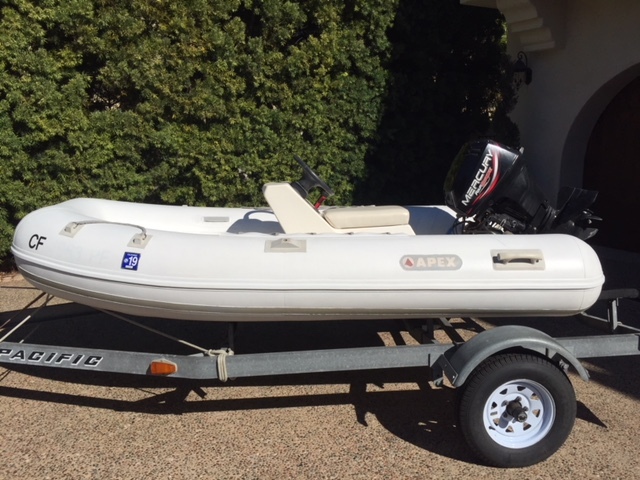 Another of our inflatable boat paint customers half-way through a major paint job on a 30 ft RIB changing it from orange to gray. Nice work! I bought a second Rieken raft in Seattle And brought it back to the 509. We float and fish the Klickitat river. 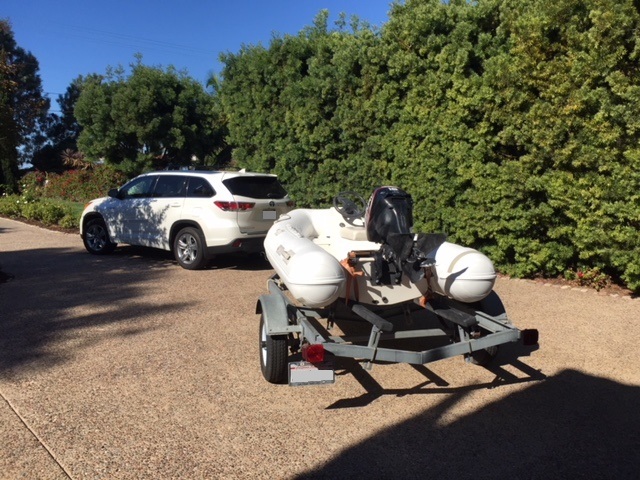 The raft held air and was well maintained with your top side paint but the bottom side was showing cloth and heavily cracked. I used your black rubber paint and problem solved. I plan to use top side and rubber paints again. I didn’t take any photos but you can catch us on the river. Grant. Hi Tina! Thanks for the follow up! I recieved my order a week after i placed it, very pleased. - Justin. My order arrived ahead of schedule and is exactly what I wanted. Thanks for the prompt service. I'll definitely order from you again.